The Bogmallo Beach Resort is ideally situated on a secluded white sand beach. Located a mere 10 minutes from the air port, you can relax almost immediately after touchdown. The Bogmallo Beach Resort is the only 5 star hotel in Goa that offers a panoramic view of the beach and the Sea from all it's 126 rooms and suites, each of which has it's own private balcony overlooking the sea. Bogmallo Beach Resort lies just 10 minutes away from the airport, on the secluded white-sand Bogmalo beach. The swaying palms and the whispering waves of the Arabian Sea create the ideal scenario for a perfect Goan holiday. The Verandah : Pamper your taste buds at 'The Verandah', the beach front coffee shop. The Nautilus : Indulge at 'The Nautilus', which offer some of the finest choices in food and drink. Gazebo : The open poolside gazebo restaurant is a gourmet's delight with its delectable grilled seafood. 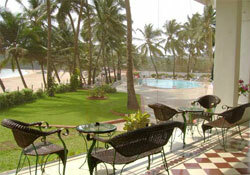 Coconut Grove : Our Goan & Indian specialty restaurant offers 5 star experience at basic price. Fro business purpose the hotel offers the facilities of meeting and conference rooms which are 3 in number. The rooms are all well equipped with the state of the art facilities and modern equipments. Sun, sand and sea rule the order of the day with the excitement of the nightlife to follow; that is the way Goa is best defined. The exciting place is visited by thousands every year to get the taste of the best of holidaying on the shores of the Arabian Sea. The state also features a range of accommodation facilities for a completely satisfying stay.